Jan 27, 2019 | about NEW products .., about Prices ..
Dave Rossum presents his new Trident module at the NAMM show 2019. It features three fully analog VCOs, which allow you to create complex, highly dynamic timbral textures. One of the oscillators is meant as the carrier. It emits three waveforms simultaneously. In detail, there are outputs for triangle, sawtooth and pulse with variable width. The other VCOs offer the same waveforms, but come equipped with just one output and a selector button. Here, while the triangle wave is selected, you can morph from saw to triangle to ramp via Symmetry knobs and CV inputs. With sawtooth active, it is possible to give the waveform a kink in the middle. Thanks to separate 1V / octave inputs as well as coarse and fine tune control elements, you may use all oscillators separately. One of the audio generators even has a phase potentiometer and control voltage input. Thus, layering all three audio signals can be quite fun. However, the real magic starts when the VCOs are interconnected. Besides the symmetry CV channel, there are sync, linear and exponential FM as well as PW inputs. Most of them feature bipolar attenuators. Furthermore, a “Zing” modulation circuit was implemented on both the modulation oscillators. – “Zing” is kind of a ring modulator, but due to synchronization, it can output complex, yet purely harmonic overtone spectra. By combining all these features, highly dynamic results are achievable. As the modulation VCOs can be set to track the carrier oscillator, it is possible to create constant wave shapes which are not influenced by the notes played. – We can’t wait to have the Trident in our showroom. Three precision analog oscillators with dedicated 1V/Octave inputs and coarse control ranges of 20Hz to 20kHz and modulated ranges of 0.01Hz to 25 kHz. Main Carrier oscillator with simultaneous triangle, sawtooth and pulse waveforms, with exponential and linear frequency modulation and pulse width modulation. Modulation Oscillator 1 with selectable triangle, sawtooth and pulse waveforms with exponential frequency modulation, variable symmetry and symmetry modulation, and variable Zing level and Zing level modulation. Modulation Oscillator 2 with selectable triangle, sawtooth and pulse waveforms with exponential frequency modulation, variable symmetry and symmetry modulation, variable Zing level and Zing level modulation, and variable phase and phase modulation. 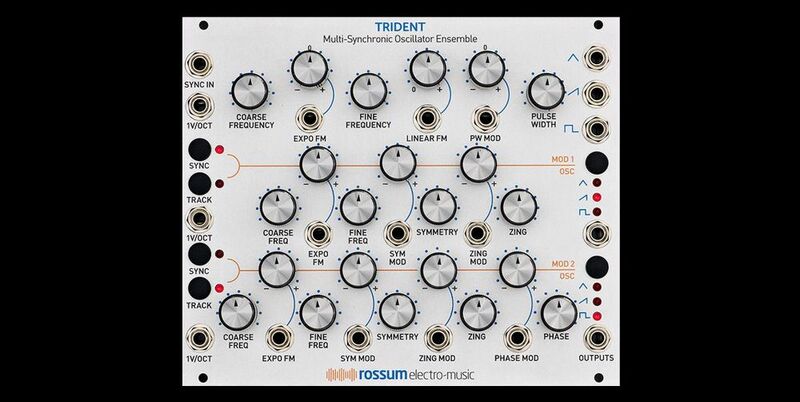 TRIDENT, like all Rossum Electro-Music modules, features solid construction, with thick aluminum panels, solid aluminum knobs, and quality components throughout.